1. 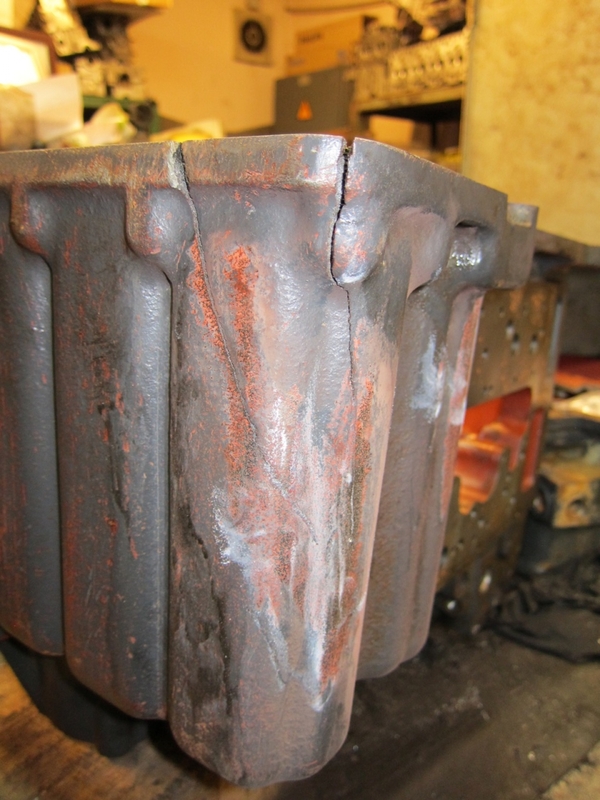 Cast iron, steel and stainless steel repairs with powder-spray method. (MAC Flame Powder Spray). 1.1. A succession of photographs showing a successful repair of cracks in a more than 100 years old REX V-2 motorcycle cylinder. 1.2. 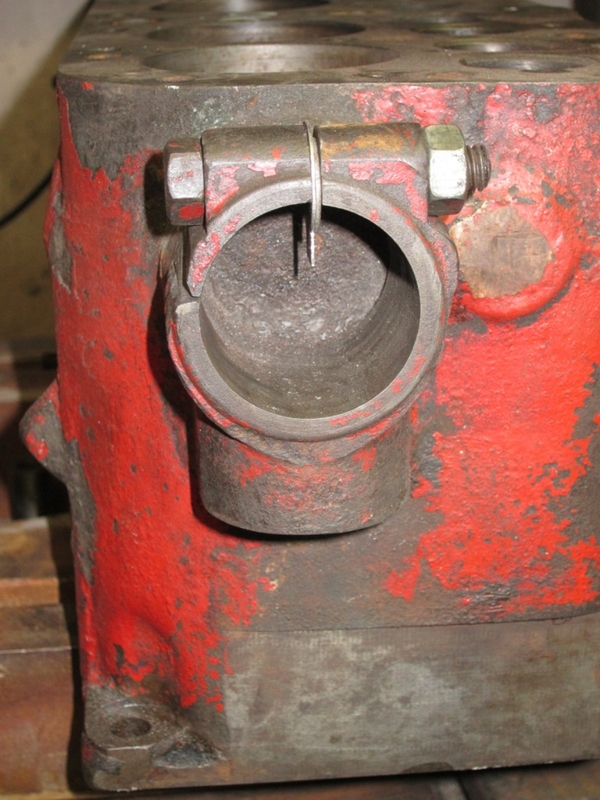 Conversion of an exhaust stub from 45 degrees to 90 degrees on a 1913 JAP engine cylinder using MAC Flame Powder Spray torch. 1.3. 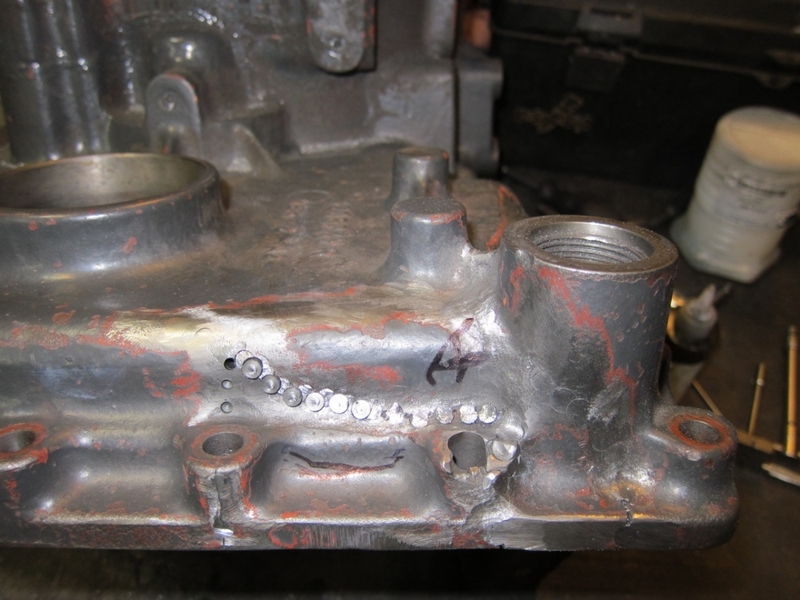 Welding with MAC Flame Powder Spray of a 1920ies FIAT car cast iron cylinder block broken stub. 1.4. 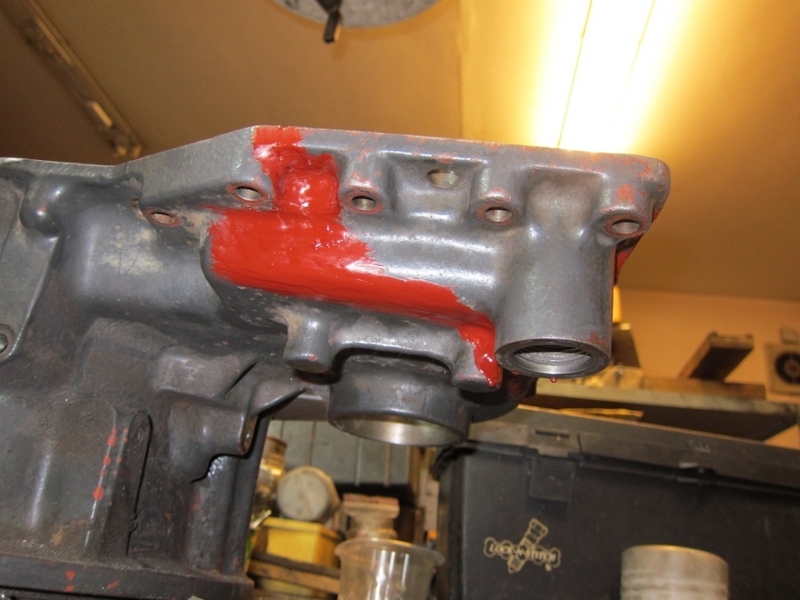 Building up a worn gearbox shaft with HRC 45 Nickel based powder using MAC Flame Powder Spray torch. 1.5. 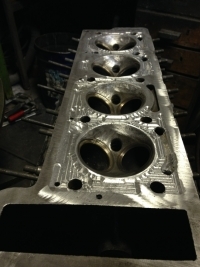 Complete resurrection – building up lost metal on a motorcycle cylinder head intake flange using HRC 15 Nickel based powder and MAC Flame Powder Spray torch. The lost piece was sawn off by a previous owner. 1.6. Enlarging the diameter of stainless steel diesel flame chambers with Nickel powder using MAC Flame Powder Spray torch. 1.7. 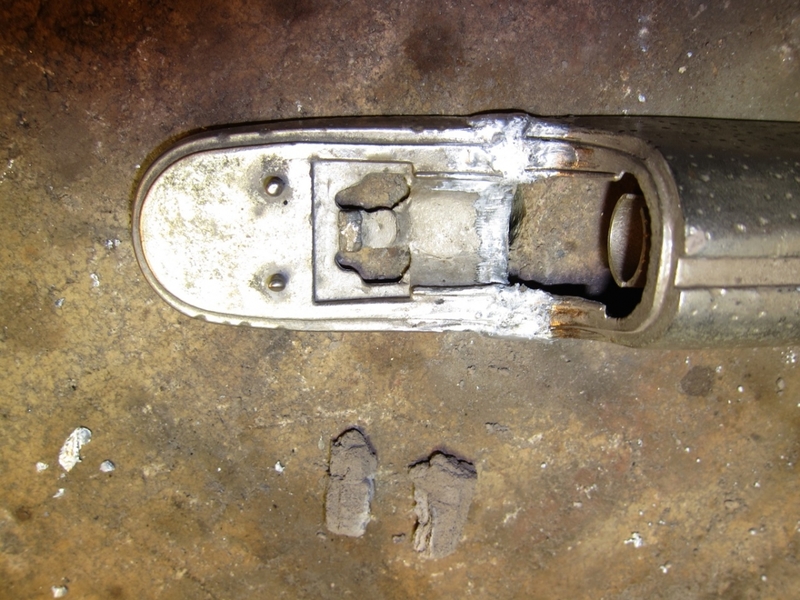 This is how a completely broken and cracked KIA car exhaust manifold could be repaired using MAC Flame Powder Spray torch and HRC 15 Nickel powder. 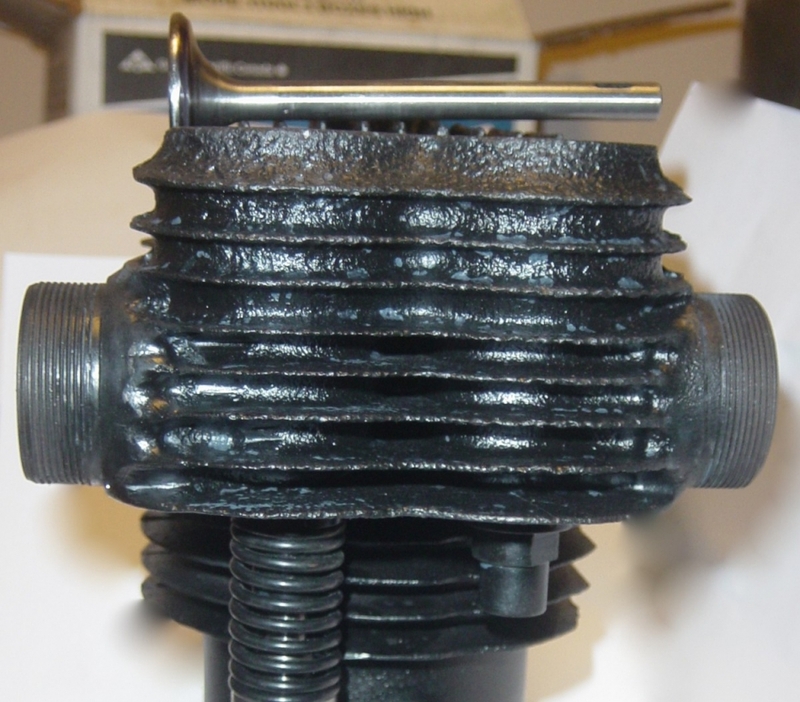 This is the only effective way of quality repair to old cast iron as there are no pores or cracks forming in the process. 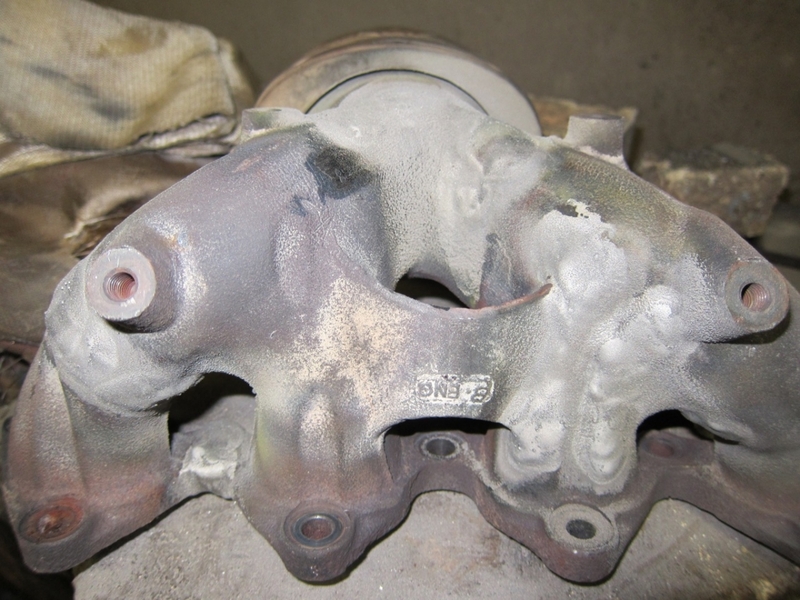 The only downside is the high cost of the process as Nickel powder is very expensive and a considerable amount of it is lost in overspray. Another serious problem is the carcinogenic nature of Nickel powder requiring fresh air face mask and protective clothing and appropriate goggles. 1.8. 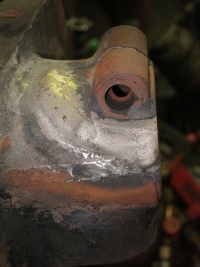 Filling of deep corrosion pitting on forged steel lug for subsequent grinding, polishing and plating. 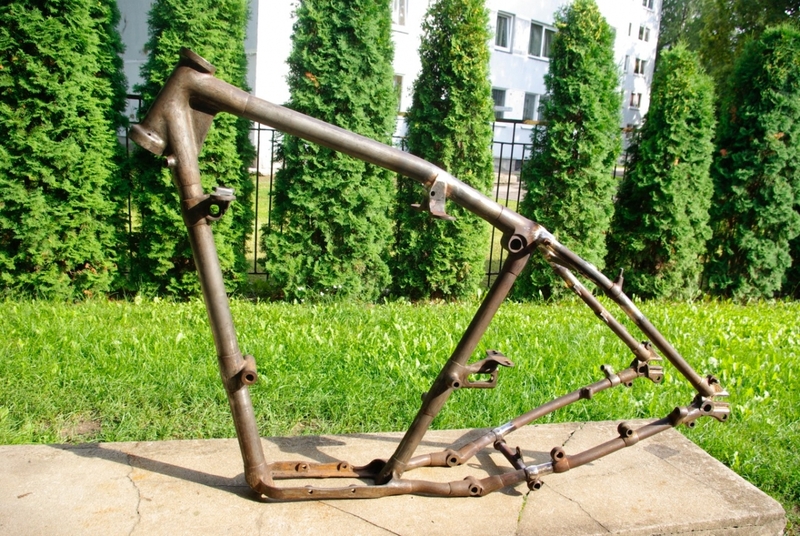 HRC 15 Nickel powder and MAC Flame Powder Spray torch is used for this project. Subsequent use of a file and abrasive paper returned the part to its former glory. 2. Cracks in cast iron engine blocks and cylinder heads are repaired with special LOCK&STITCH tooling and pins to ensure that there is no distortion of the component geometry and the cracks are permanently sealed to withstand water, steam, oil and fuel. 2.1. 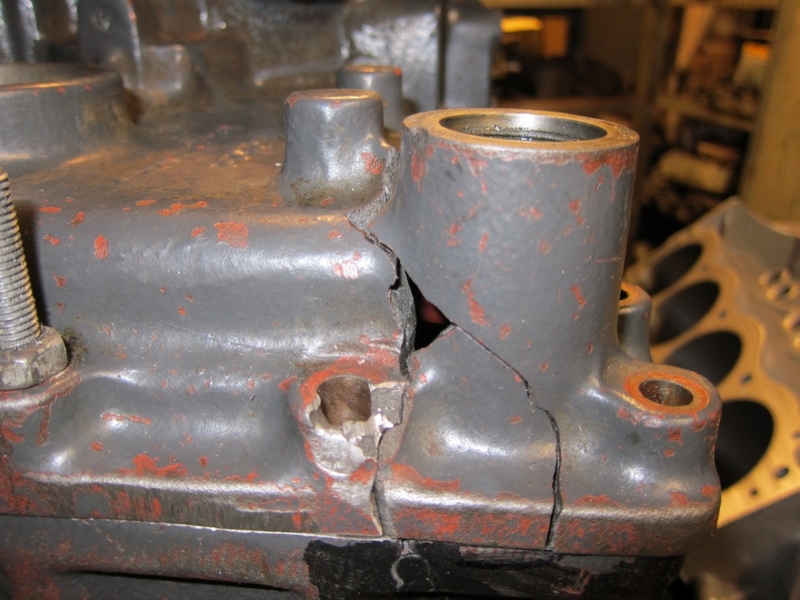 Repair of some serious cracks on a 1913 LANCIA cylinder block using American LOCK&STITCH technology and materials. 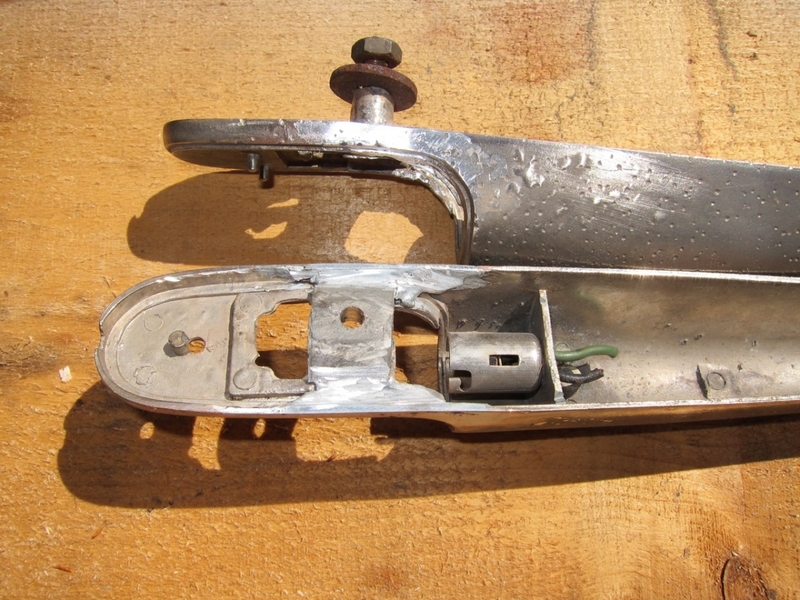 The damaged area had previously been covered with an unsightly patch stuck on epoxy glue with self tapping screws. One of the cracks had been V-grooved for subsequent welding which was fortunately not done. Had it been welded improperly, the seam would be stone hard and impossible to drill or tap. Lloyds International Ship Register approves only of cold stitching of cast iron blocks and parts. 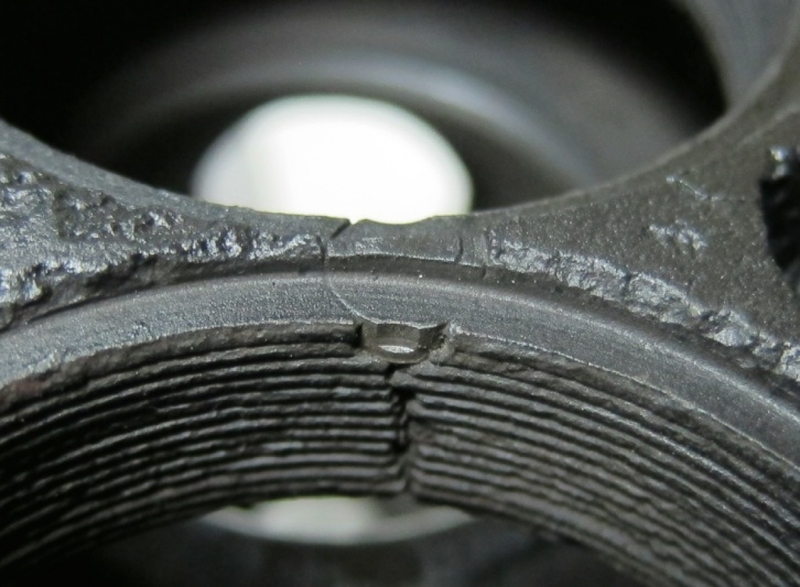 Cracks are detected with MAGNAFLUX method, employing 2 strong permanent magnets and special powder, which indicates even minute, sometimes invisible cracks. 2.2. 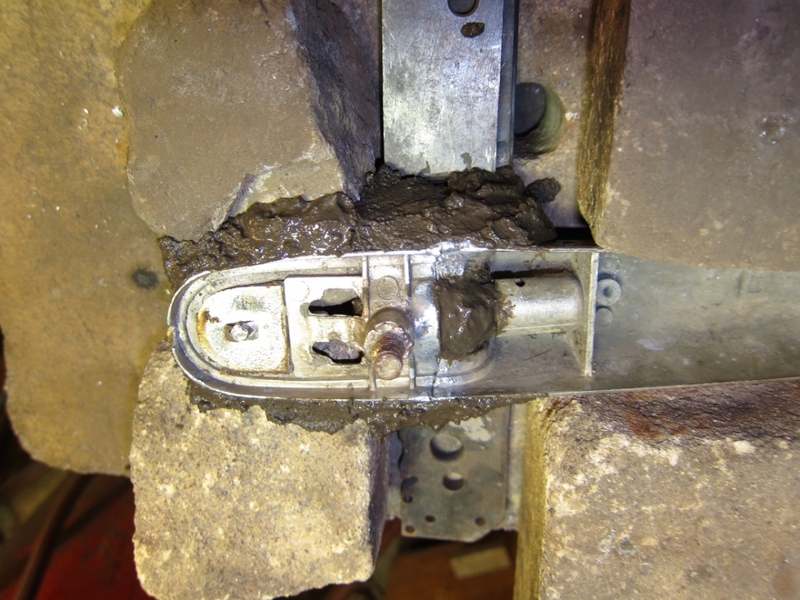 Repair of a cracked HORCH automobile block, using American LOCK& STITCH technology and materials. 2.3. 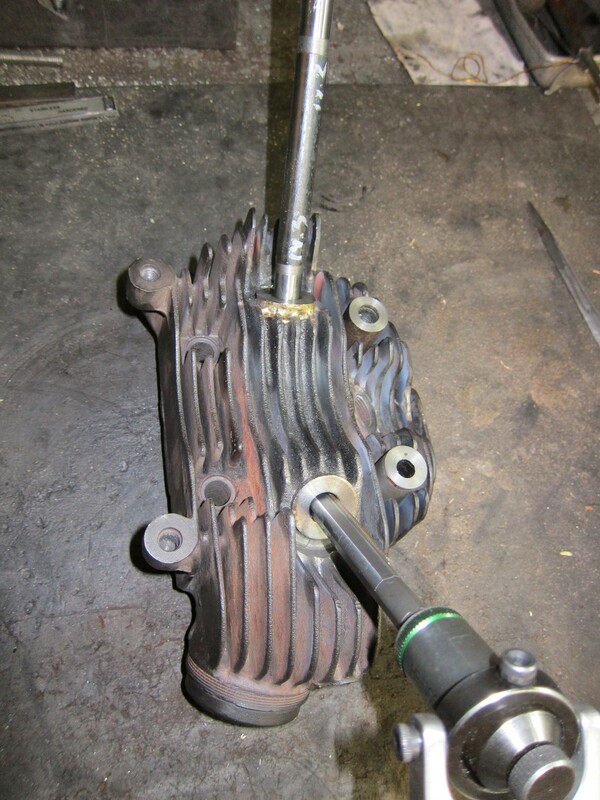 Repair of a crack between INDIAN motorcycle cylinder valve plug threaded holes using a LOCK&STITCH technology and 1 threaded pin. 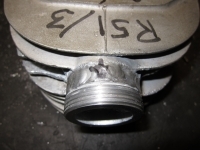 The crack is in a very narrow spot and the existing valve plug threads do not allow the use of any brazing or fusion welding methods. 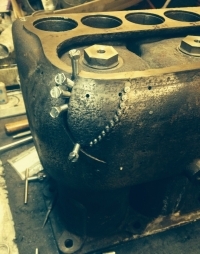 The threaded pin has “saw tooth" thread and a "dovetail" under the head thus allowing to draw the two sides of the crack together and to relieve the stress. 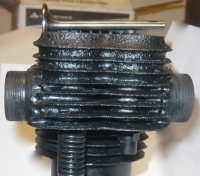 After braking off the hexagon screw head the remainder of the screw has been skimmed smooth. 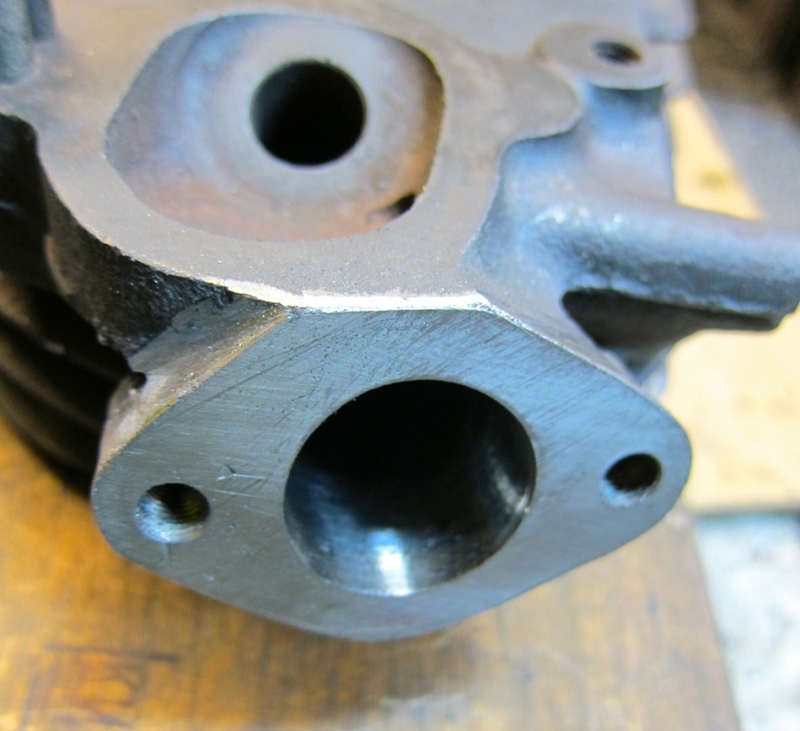 ON CAST IRON MOTORCYCLE CYLINDER AND HEAD REPAIRS. I would like to touch on a subject which I found has not been covered adequately in most motorcycle restoration books – it is about successful repairs of cast iron cylinders, heads and other intricate cast iron parts. 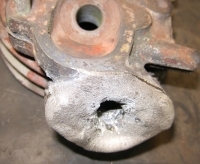 One of the biggest headaches of a restorer nowadays still is -- how to efficiently repair cracks, broken exhaust stubs, repair threads, etc. 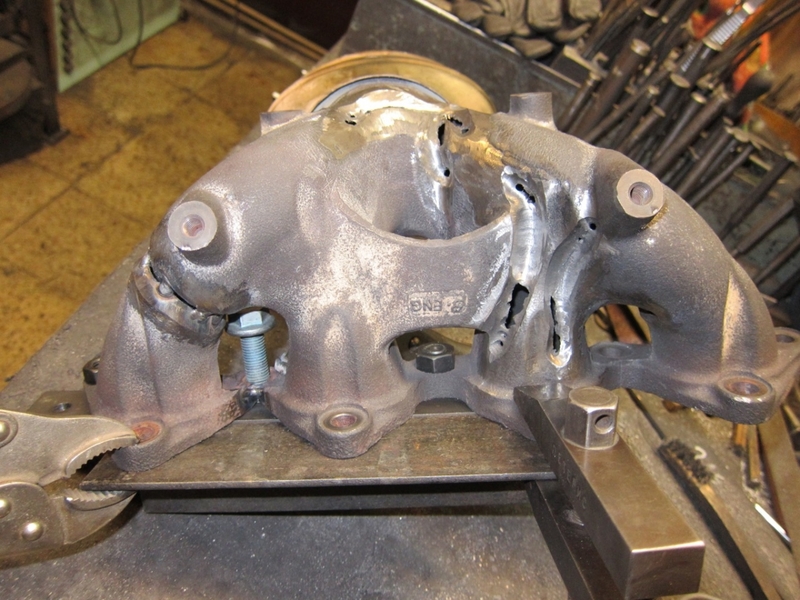 Continuous experimentation, restoration work and challenges involved will weather ones competence and mistakes made will teach lessons, how not to do it or how to do it properly -- next time. Above all it takes perseverance, patience and even courage to see the process through to a successful finish. The fruits, if worthwhile, can be very rewarding. 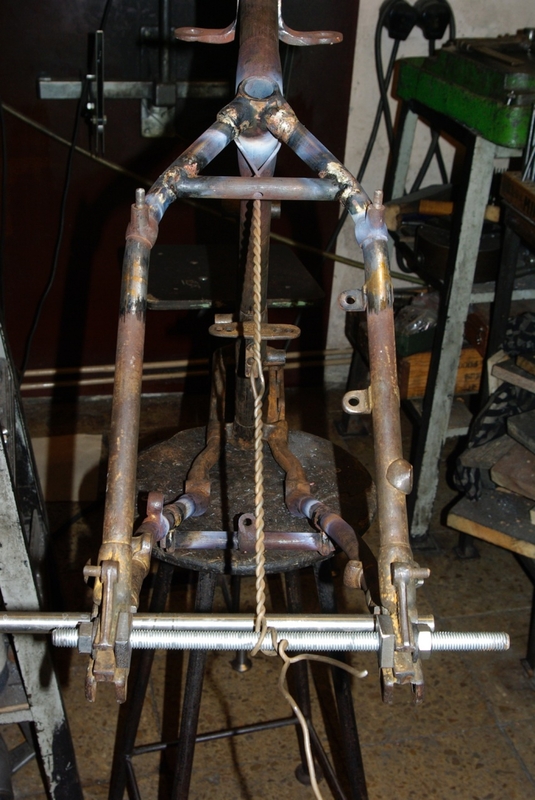 Most of the orthodox old-time basic methods of welding cast iron involve the use of an oven, big enough to heat the part to be welded to red hot condition and to anneal it in the oven after the welding is done to remove any stresses. Most MIG (Metal Inert Gas), TIG (Tungsten Inert Gas), SMAW (Shielded Metal Arc Welding) or Stick Welding and Oxy-Acetylene welding without proper pre-heating and post-heating will produce unpredictable results, more cracks, poor quality welds or totally destroyed parts, especially if done on old cast iron cylinders or heads. 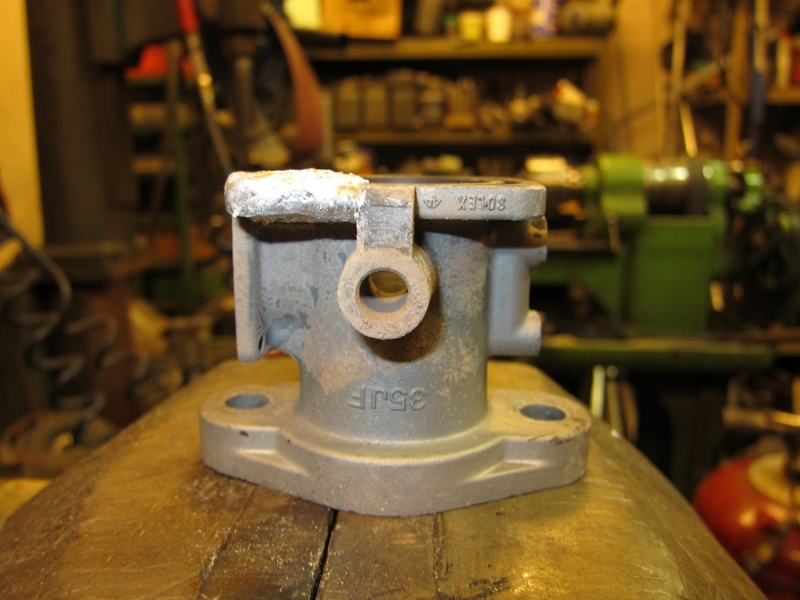 On rare occasions though the results can be satisfactory, but these cannot be taken for granted with any future welding jobs on cast iron. 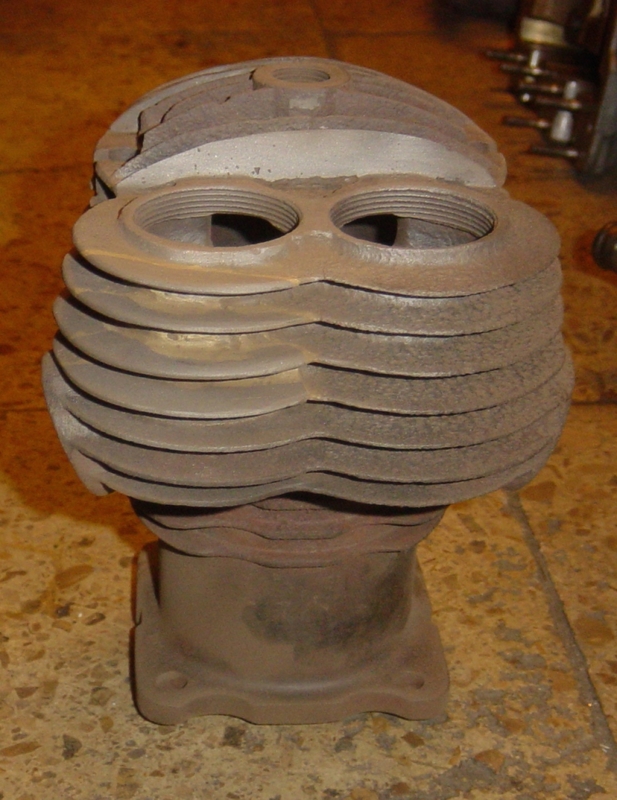 Besides even pre- and post-heating in an oven does not guarantee against distortion of the whole component. 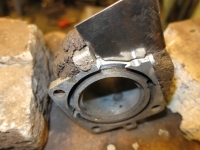 Holes and bores can get elongated, parts can literally “grow” in size and they can soften, depending on the material they are made in. 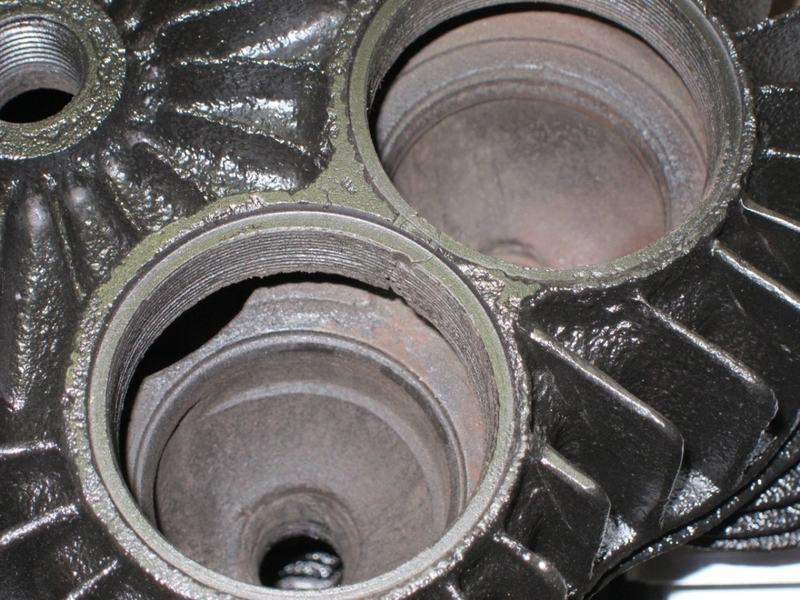 Often the results are influenced by the type of cast iron used, whether it is gray, ductile or mallible, how old it is and how saturated with oil and other contaminants it is. 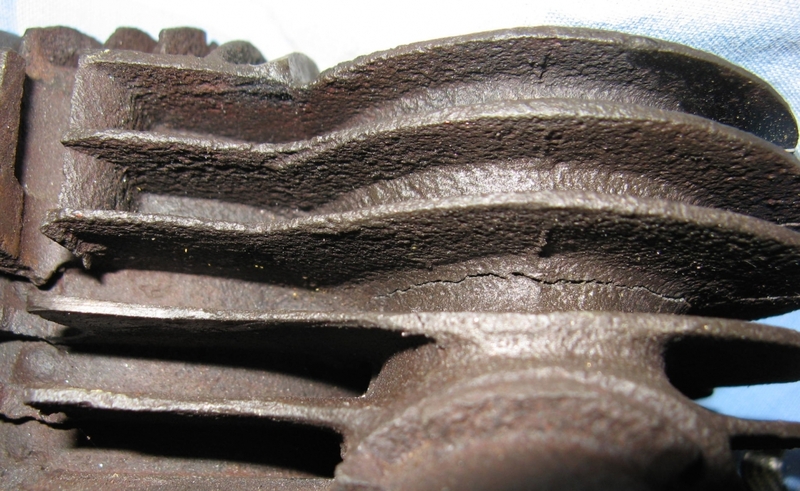 The experiences gained from welding modern types of cast iron do not work with any, centuries old cast iron because of the technical progress in metallurgy. 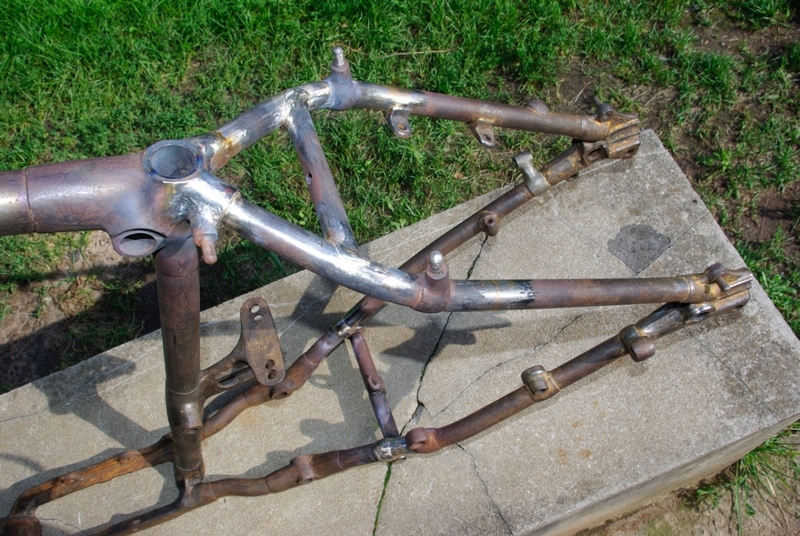 As with most welding jobs the cleaner the part to be welded the better. 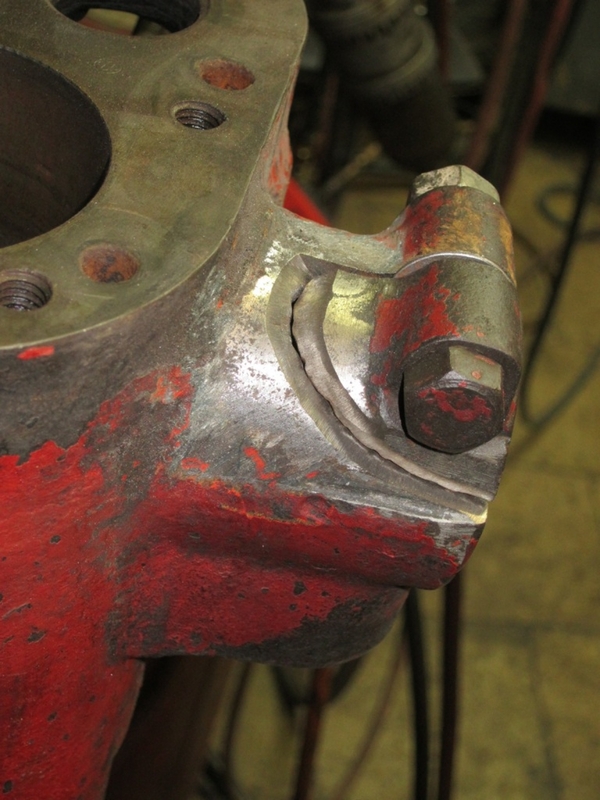 Cast iron welding in most cases will produce unsightly pores on the surface of the seam and inside the seam as well. 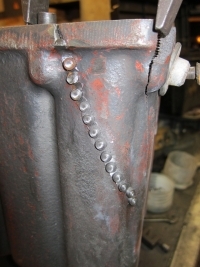 These pores are trapped bubbles, which come out as holes if the weld is filed or ground. 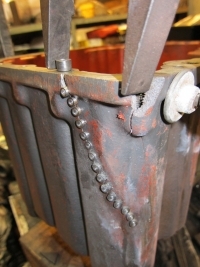 One good method is to heat the parts to be welded with a propane/air torch to burn out the oil that has saturated the parts. 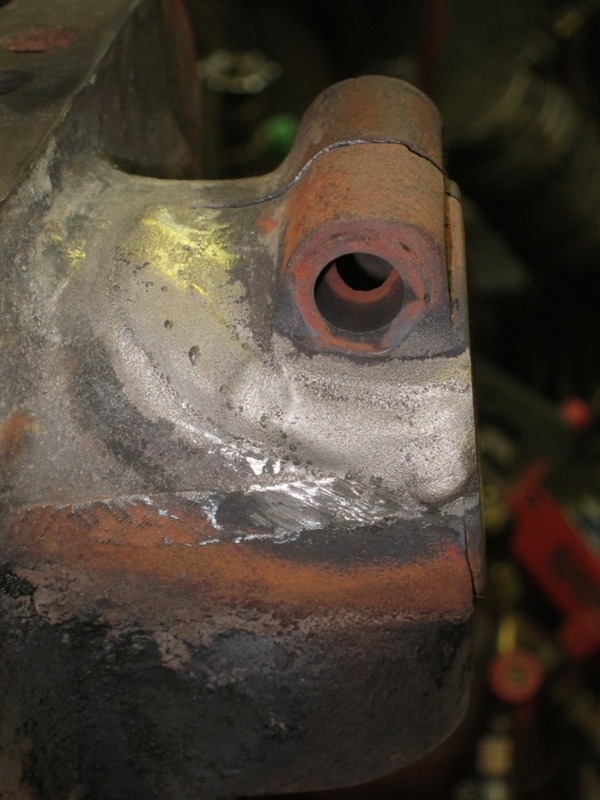 It is surprising how much better the part is welding after burning out oil. 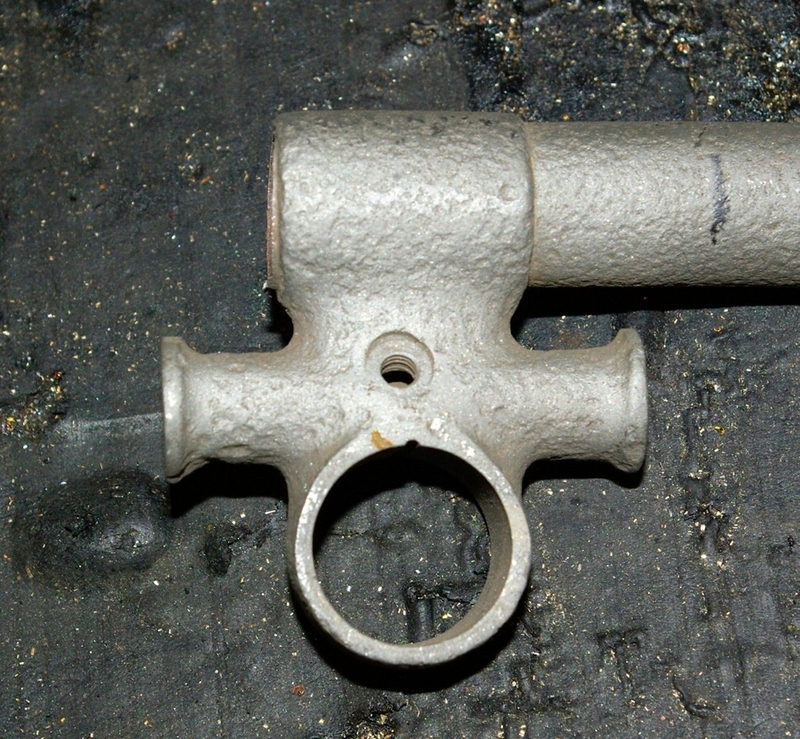 Besides the generally known methods of cast iron welding and brazing, there is a long forgotten and comparatively old-fashioned method called Flame Powder Spray. 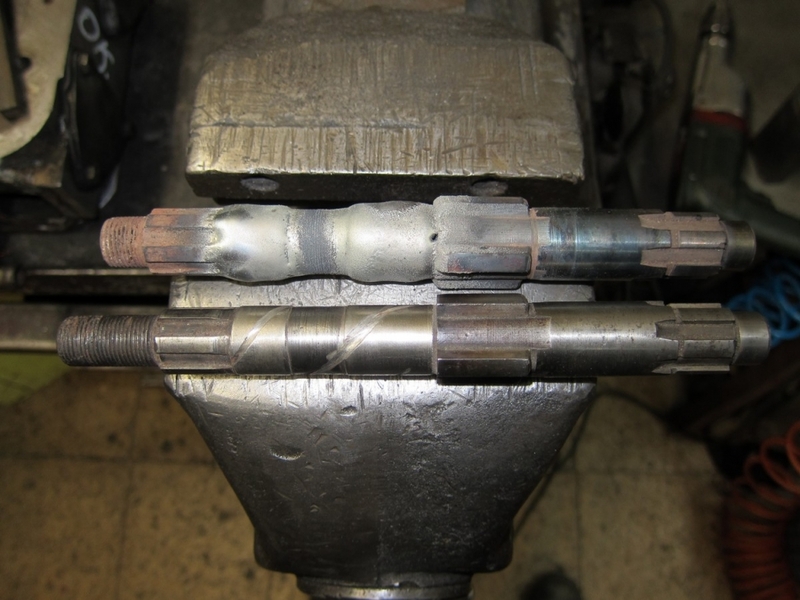 This method involves the use of a special Oxy-Acetylene torch, which has a small bunker with a trigger, which dispenses fine Nickel alloy powder through oxygen line unto the heated part. 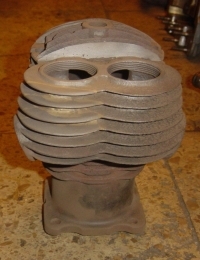 The powder is blown precisely where it is needed and can be deposited and melted in a thin or thick layer. 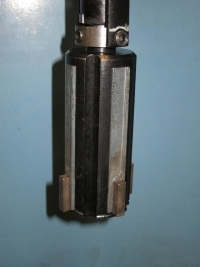 The trigger must be pressed before the part starts to blue – i.e. before 300 degrees Centigrade is reached and the temperature of 1150 degrees Centigrade can be reached very soon. No pre-heating is necessary as such. 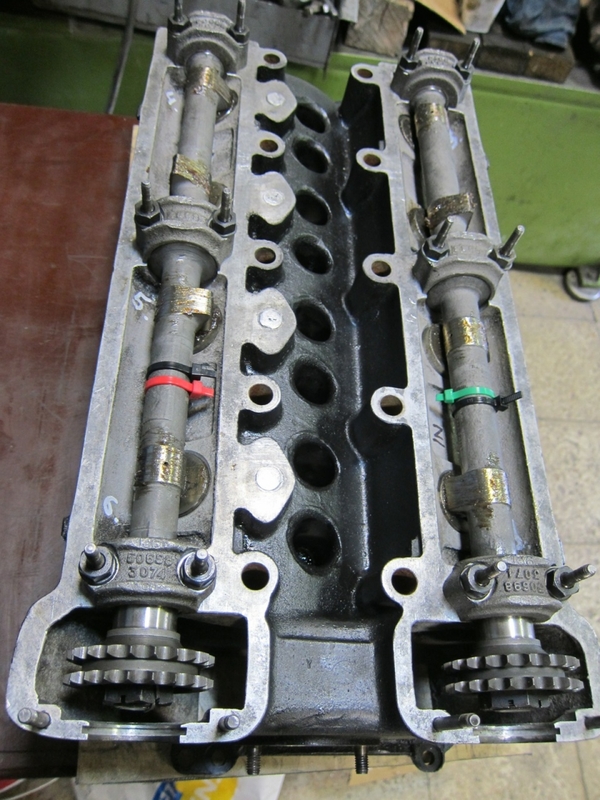 There are different sizes of nozzles to be used according to the size of the job. The parts must be properly cleaned, V-grooved and if possible sandblasted or ground accordingly. 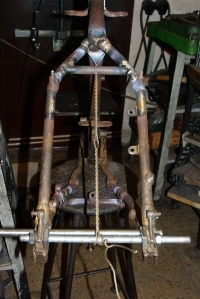 After the Flame Powder Spray welding is done the part should be wrapped in a fiberglass blanket or even better submerged in Vermiculate powder, which helps to dissipate heat evenly and will hold the heat for many hours. Any ventilation or access of cold air into the room should be avoided. It is best to leave the parts covered and in peace for a few hours. This welding method is the best method that can be used successfully for the restoration of old cast iron parts without pre-heating and after heating in an oven. 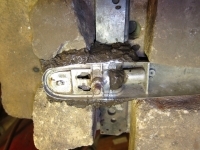 Due to good penetration and diffusion into the parent metal this method does not produce porosity or cracks. Different HRC (Rockwell Hardness) Nickel base powders are available. For cast iron motorcycle cylinders HRC 15 is preferable because the weld seams can be worked easily with a file or machined, drilled and threaded. 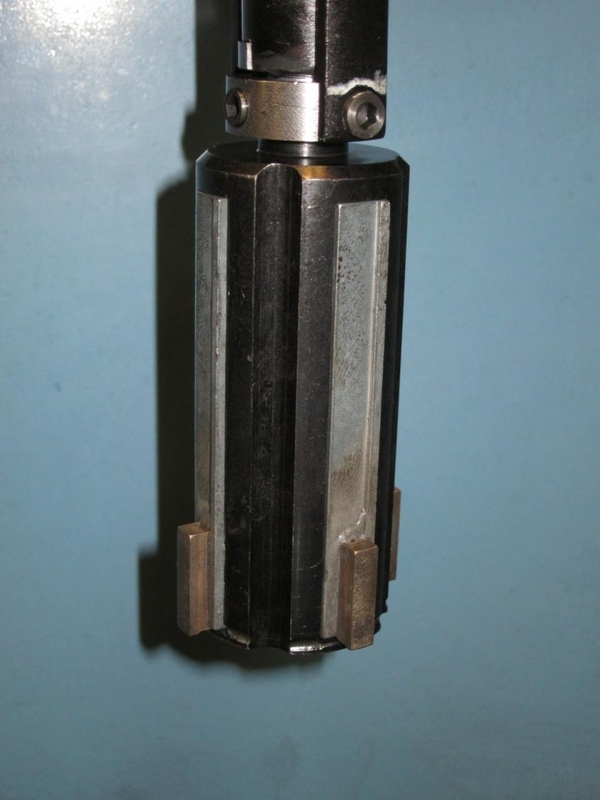 HRC 40 or higher would be a good material for worn steel gearbox shafts. These powders are actually round particles of Nickel alloy manufactured by blowing molten metal into water and then calibrating it to a certain size. 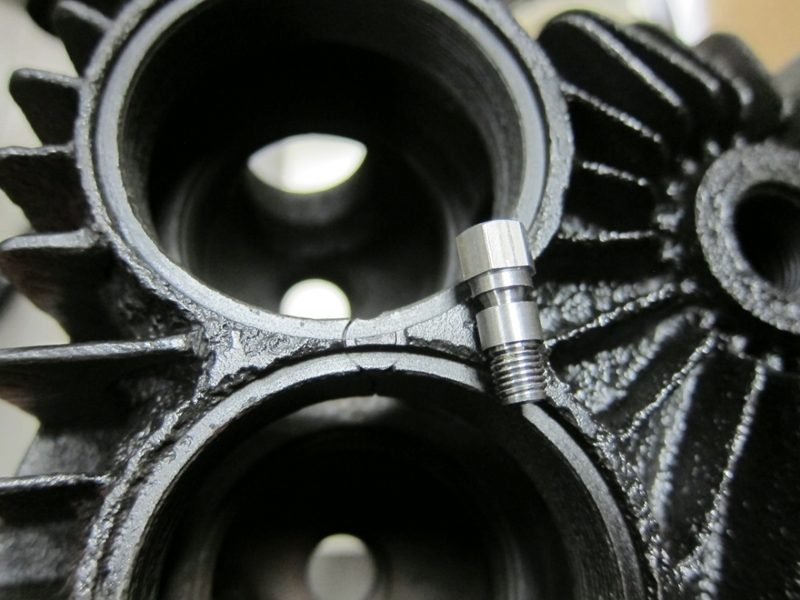 Threaded stubs can be best made from used cast iron car camshafts. 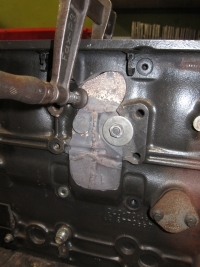 The thread would have to be protected by covering with a piece of thin stainless steel strip, which can be secured with a stainless steel wire wound around it and scrolled tight. 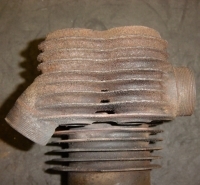 Even if the strip will get welded to the exhaust stub it can be later easily removed and cleaned up with a file. There are some advantages that rank this method above most others. 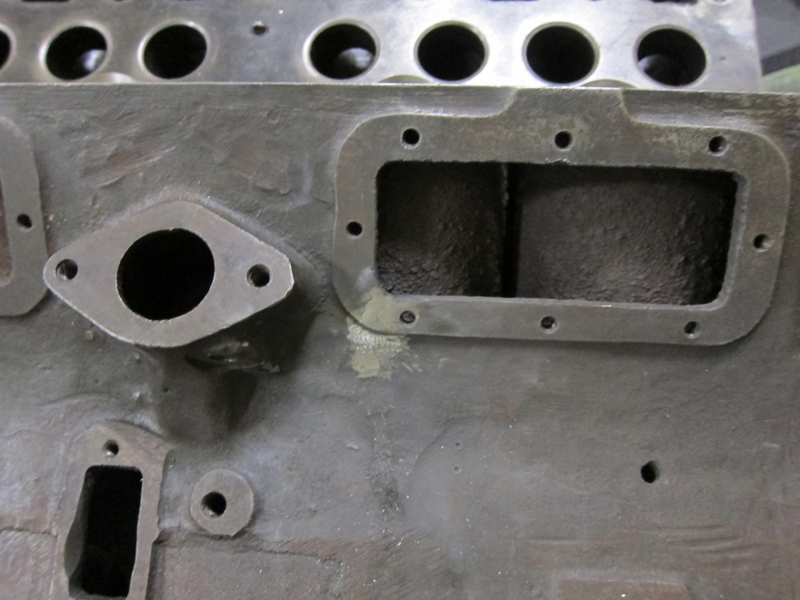 The most important advantage of Flame Powder Spray is that it can be successfully used on parts that would be subsequently Nickel plated. The lack of pinholes, cracks and pores make it possible. 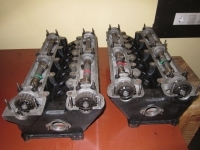 It is especially handy when rebuilding old cylinders, intake manifolds, highly corroded fork parts or lugs and other similar parts that need to be subsequently plated. 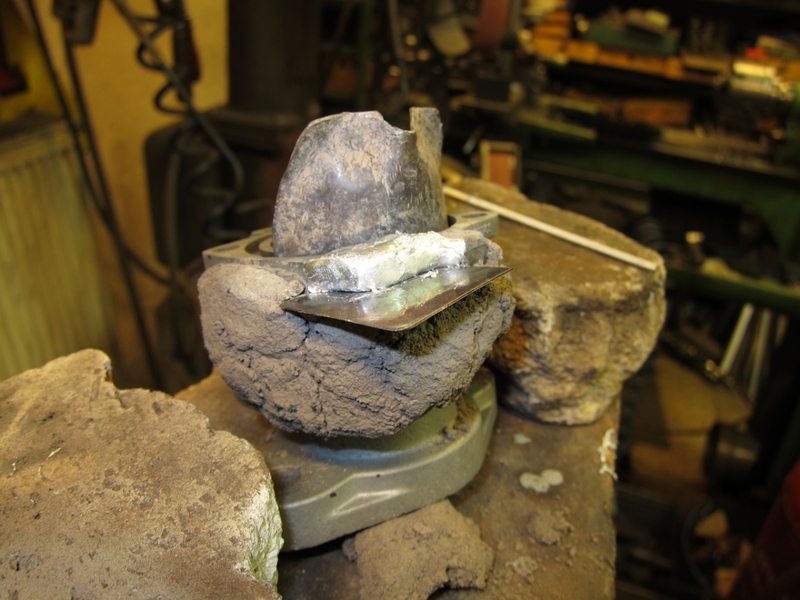 One must not forget to warn the plater that the part to be plated has a thick deposit of welded Nickel, otherwise he may try to remove it thinking that it is old plating. 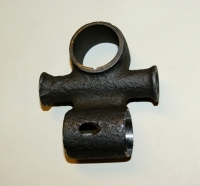 It also provides a possibility of joining newly fabricated steel parts to the old cast iron parts. 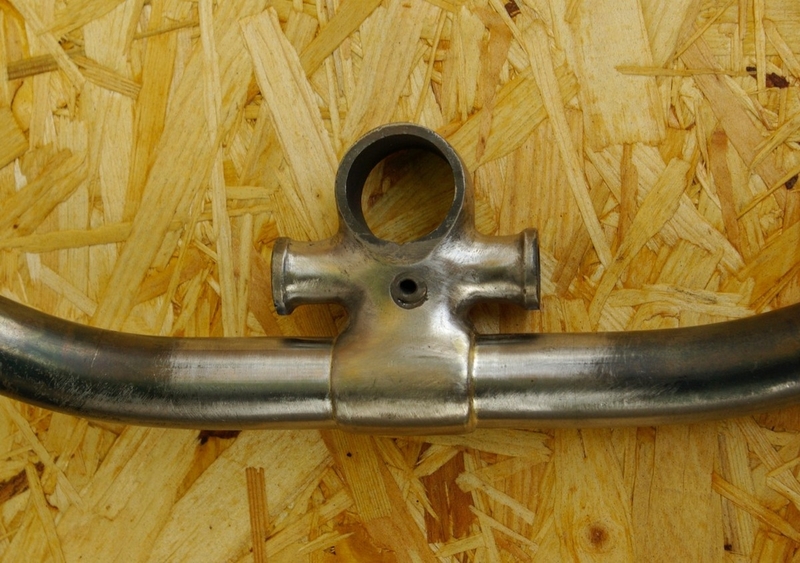 Flame Powder Spray equipment also allows to spray bronze powder on bronze and steel parts without the necessity to use flux. 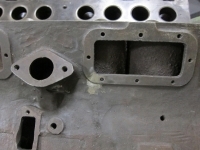 Due to the high penetration ability of molten Nickel alloy powder into cast iron the resulting welds are very strong and uniform. You can build up missing material with no practical limits. 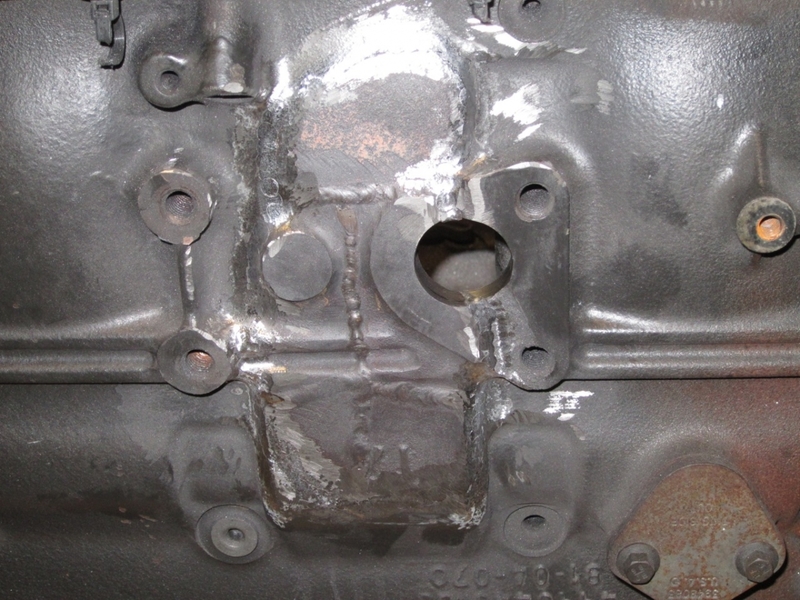 Fill holes, repair cracks, add broken or missing cylinder base flange, etc. 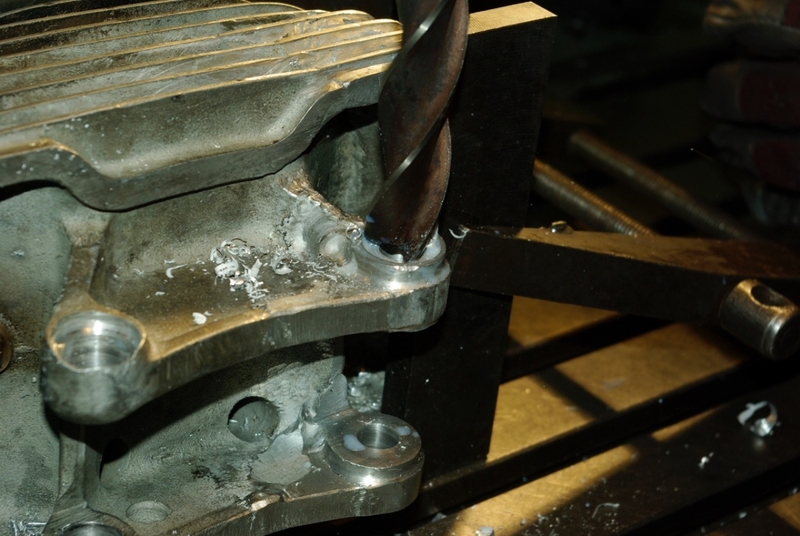 If there are holes, segment recesses or even threads that need to be retained or protected from filling with weld, soft carbon material can be shaped and used with imagination in these recesses or threads for subsequent retention of the original shapes. The down side of this method is the high cost of Nickel powder and its carcinogenic nature. A fresh air facemask is a must as is protective clothing and appropriate goggles. 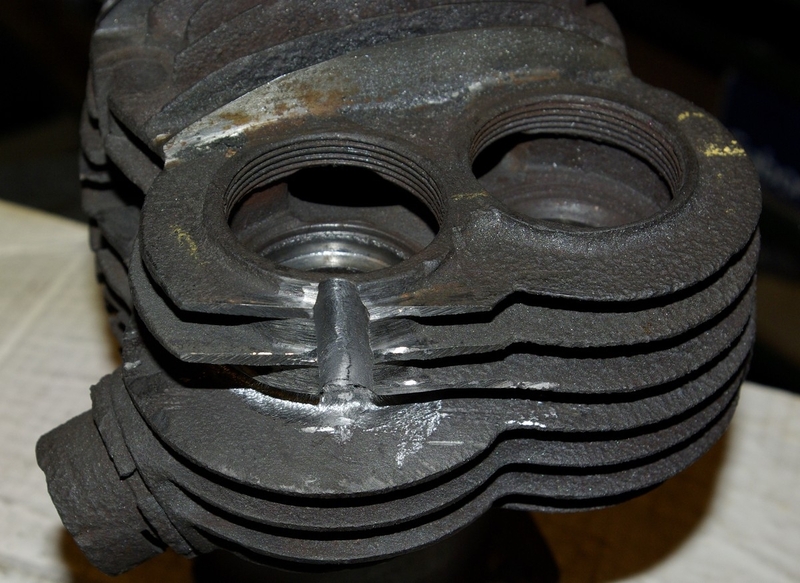 Another cautionary note – do not use this method on cracks in automobile cylinder heads or blocks. It will not work with this application! One can add a broken off bracket or stub to a cylinder block corner or fill heavy corrosion pitting in cast iron automotive cylinder heads with Flame Powder Spray, but it is best to stay away from cracks in blocks and heads with this method. Lloyds Register of Ships only approves metal stitching with pins for cracks in marine engine blocks and heads. 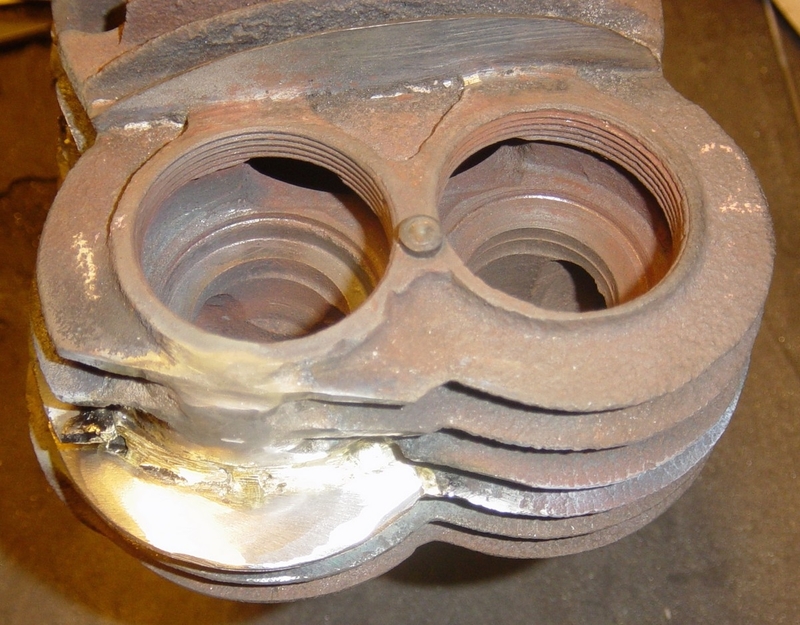 One of the best methods for repairing broken off ribs on air-cooled cast iron cylinders is brazing with silver or bronze rod. Lower temperature silver brazing is best for any work that is done in close proximity to the cylinder – just to avoid too much distortion to the bore. Bronze rod is cheaper and thus can be used to join broken off pieces on top of the ribs where higher brazing temperature would not matter much. 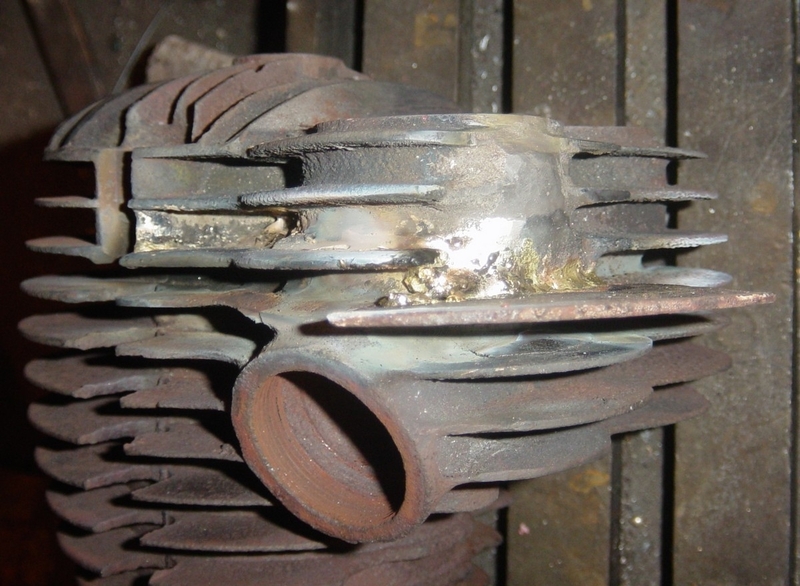 Brazing in general will not cause as much stress and cracks as with other types of arc welding where harder materials are used. Finally a few words on cold metal stitching with metal pins. 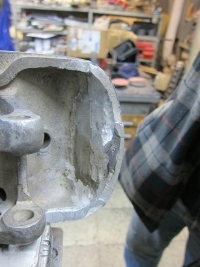 Air-cooled motorcycle cylinders may have a few weak spots where welding and/or brazing cannot be used for a successful repair, unless one can get involved with production of expensive jigs, taps and/or use of appropriate equipment. Even then the anticipated results are not always achieved. 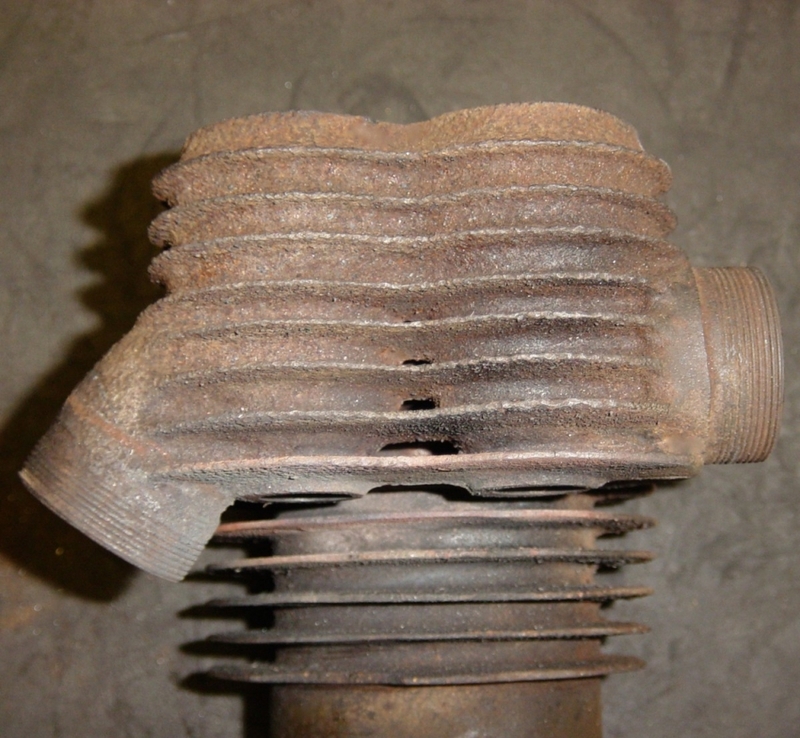 One such area is cracks between threaded valve plug holes on side valve cylinders. These can be successfully repaired using a single Lock&Stitch threaded pin, which has a “saw-tooth” thread and a “dove-tail” under the head. 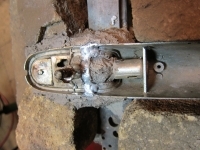 The repair is done by first drilling an appropriately sized hole in the middle of the crack. Then it is threaded with a “saw-tooth” tap and then the “dove-tail” recess is machined on top with a special cutter. 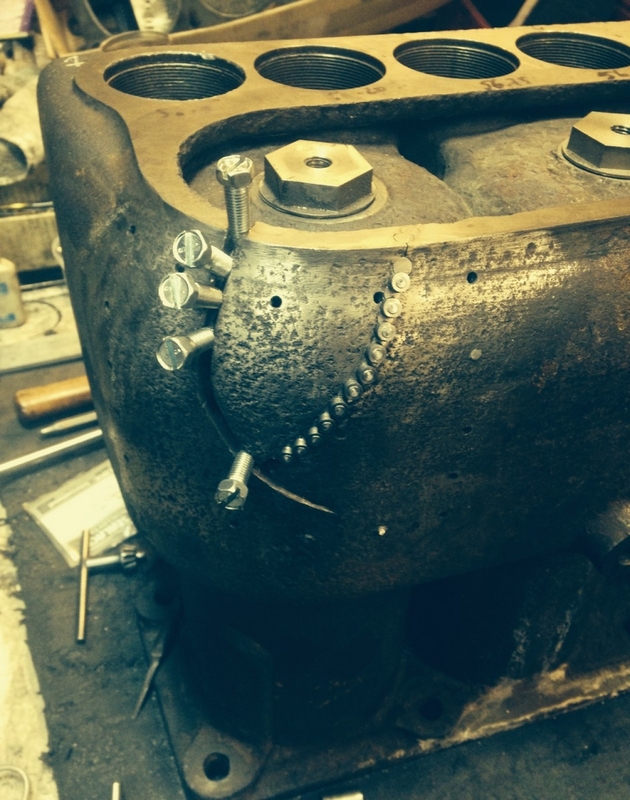 The pin is screwed down and tightened snugly until the hex head breaks off. The final operation is machining the protruded head stub to allow for smooth finish for the valve plug copper gasket. 2.4. 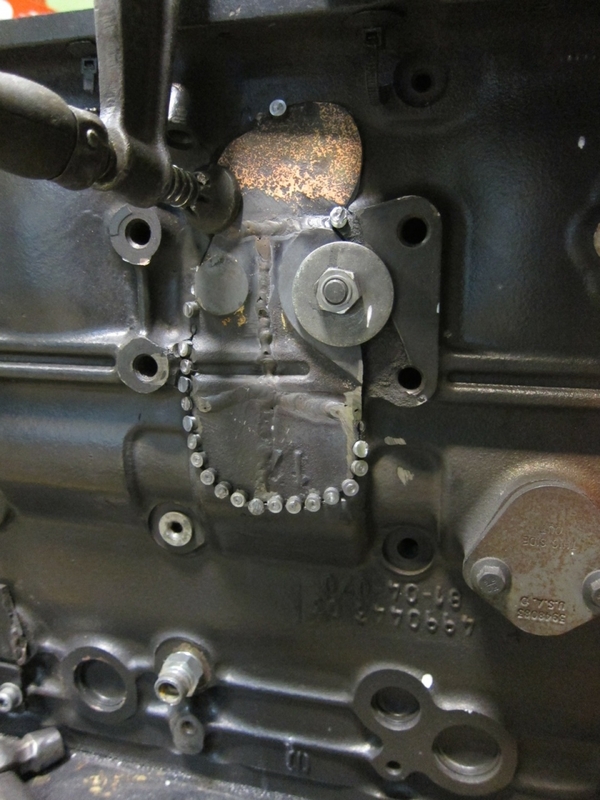 Repair of a cracked CASE excavator gearbox, using American LOCK&STITCH technology and materials. This method fully avoided any distortion. 2.5. Repair of a hole, caused by a thrown rod in an American biogas cogeneration engine block with LOCK&STITCH technology and materials. 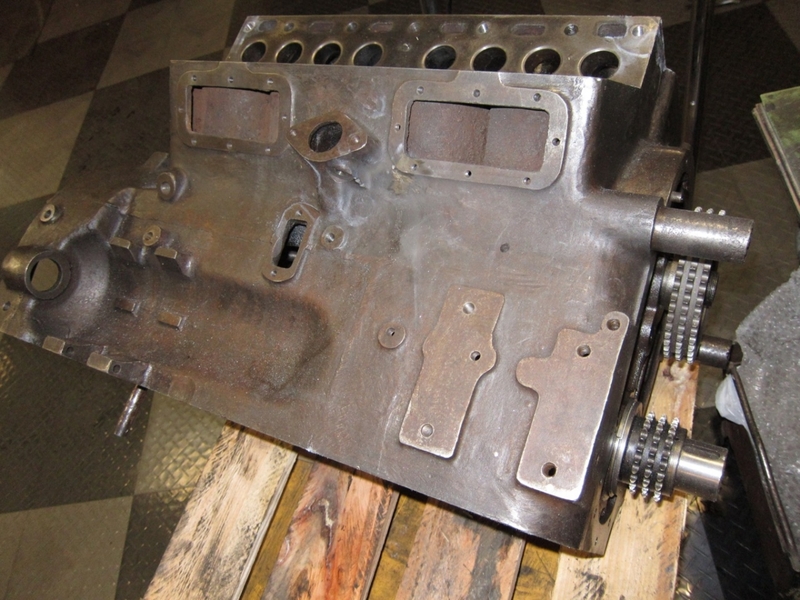 The patch was welded up from several small cast iron pieces and the job was annealed in an oven to eliminate distortion and hardening. 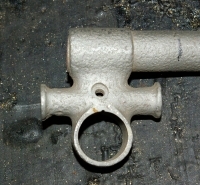 The top portion was added from an old piece of cast iron, because the original had been lost. 3. 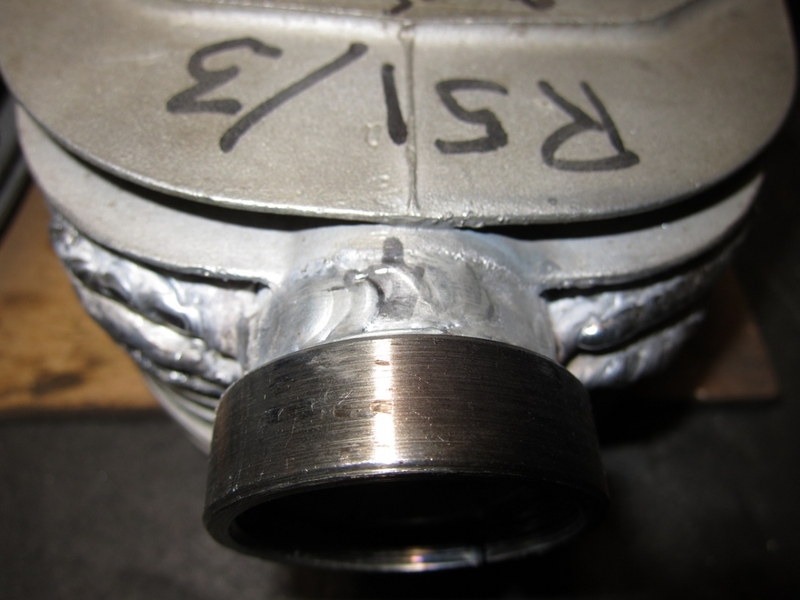 Aluminium welding with TIG (Tungsten electrode in Inert Gas) and welding filler rod. 3.1. 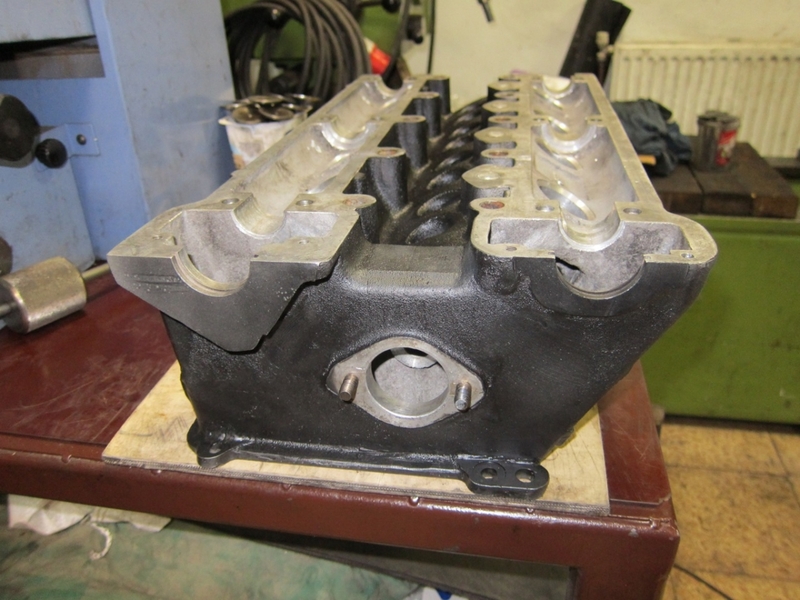 MASERATI model Mexico 4.2 litre engine cylinder head restoration and general overhaul. 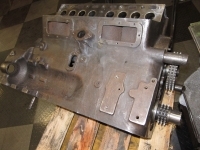 The water jacket orifices and the cylinder head surfaces had been deeply corroded through the use of water as coolant and these had to be welded several times. 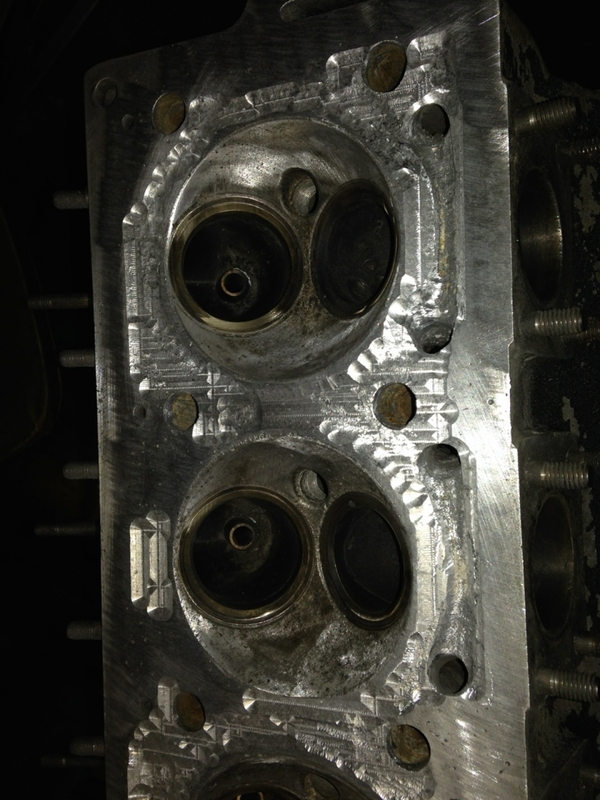 The heads had several cracks. 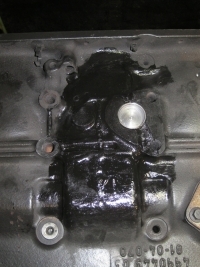 The paintwork of the heads was renewed by using Black Kephos 1096 – semi-matt single pack paint, containing phosphoric acid that etched into the metal surface. 3.2. 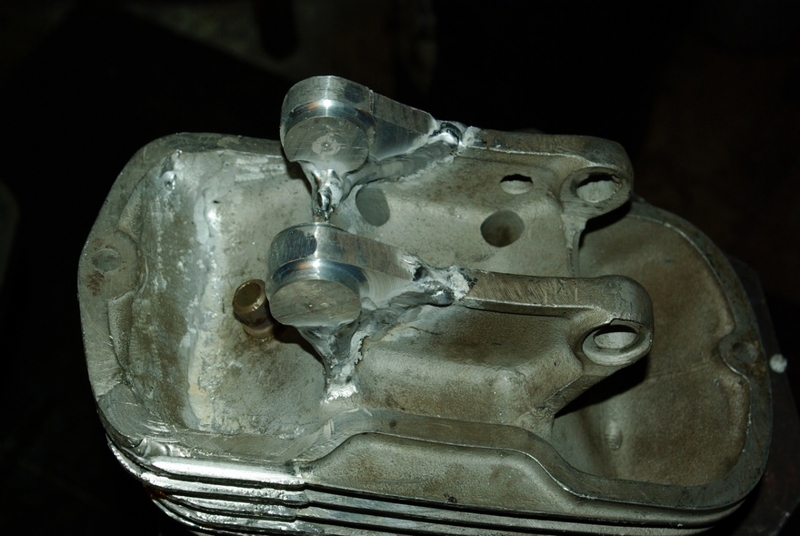 Repair welding of broken ribs and other damage on BMW aluminium cylinder heads with TIG and filler rod. 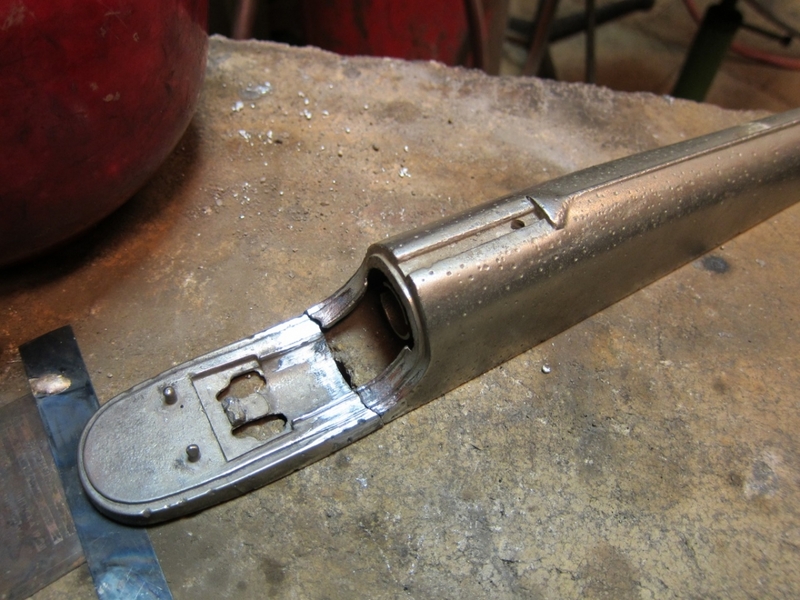 The exhaust stubs have been sawn off and new stubs added on. The broken off rocker standards have been made from tough duraluminium, these have been welded on with TIG and subsequently line bored. 4. TECHNO-WELD British welding technology and materials allow successful welding of mazac, aluminium and magnesium alloys and joining them together. It also allows the reconditioning of complex threads in automotive cylinder heads as well as joining of thin and thick materials. 4.1. Repair welding of HORCH automotive carburetor SOLEX mixing chamber by using British TECHNO-WELD welding materials and technology – without any flux. 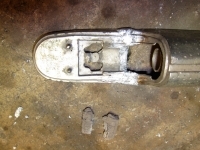 The broken off and lost part is re-created. 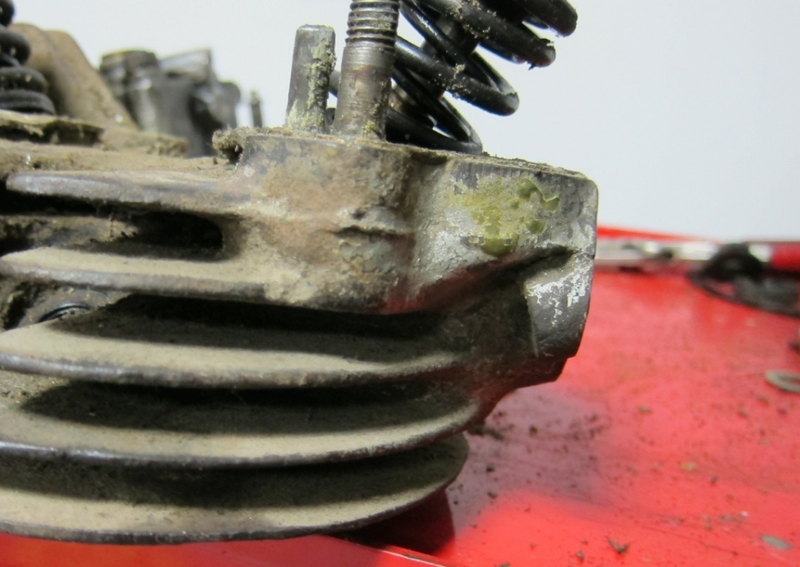 The carburetor body must be kept in an oven for several hours in order that the residue oil products can evaporate from the numerous pores that are typical of mazac. 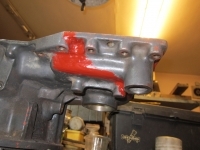 If this precaution is not adhered to the carburettor can start to blister and its surface can send small bits as “shrapnels” around the room (!) 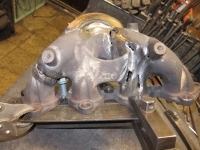 eye damage is imminent as well as the carburettor body will be severely damaged. 4.2. 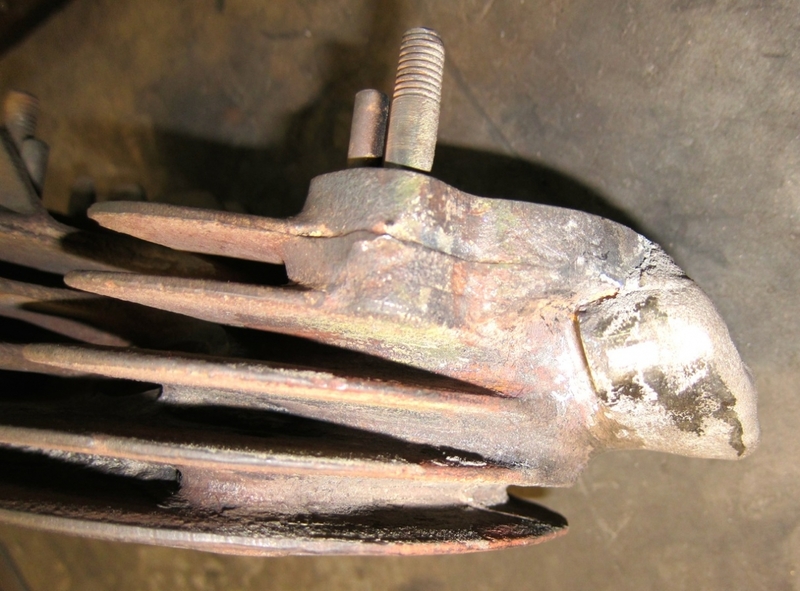 Repair welding of mazac turn indicators of Russian ZIM automobile, using British TECHNO-WELD materials and technology. 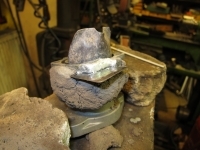 In order to preserve the shape of the parts and to avoid collapsing of the metal, builder’s clay mixed with sand and water is used. There are different honing technologies and tooling in the arsenal of the RAMOTO workshop. 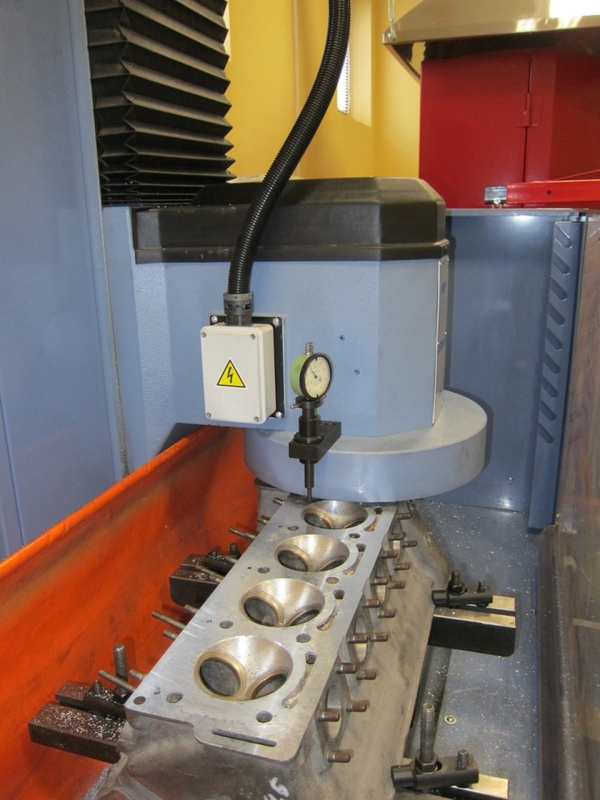 For motorcycle and car cylinders “Rigid” diamond hones are used with DELAPENA programmable honing machine. 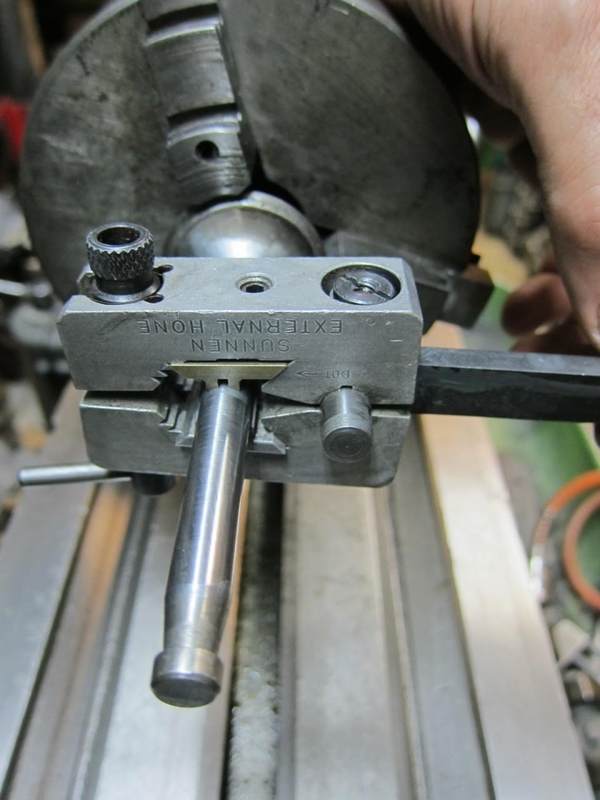 We also use small diameter internal diamond hones in the range of 4mm – 14 mm for honing valve guides as well as an “External Hone” for honing the outside diameter of valves. 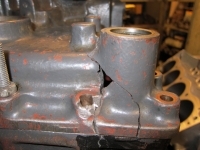 The final operation is honing the bores with FLEX-HONE Instruments, which insure that the vehicles do not have to be broken in after the repair, they can be used effectively from the start. 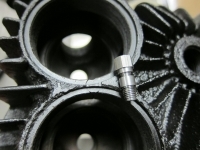 FLEX-HONE Instruments ensure a PLATO FINISH on the cylinder surfaces that retains oil, raises the compression, improves startability and also improves the engine performance. 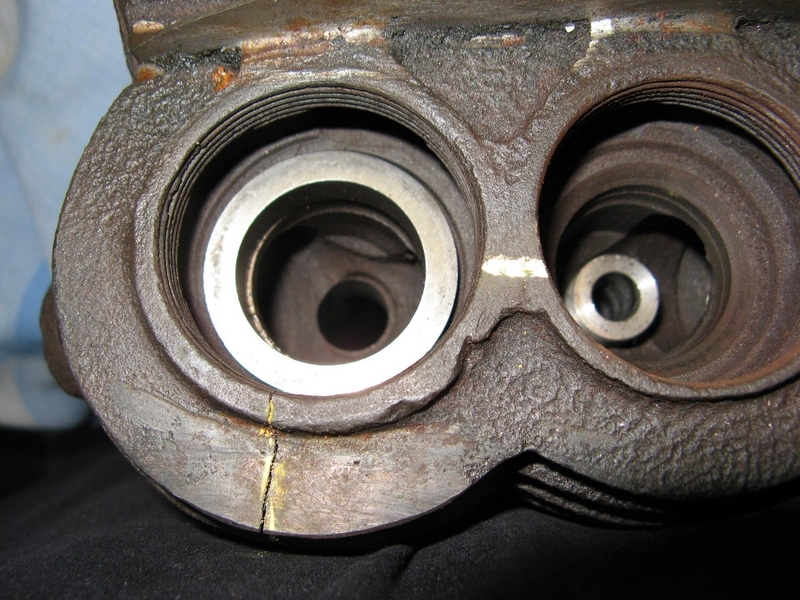 When applied to worn “mirror” finish of engine cylinders FLEX-HONE Instruments create a scratched pattern that helps retain oil on the cylinders, the exhaust smoke and the oil consumption are both substantially reduced. 5.2. 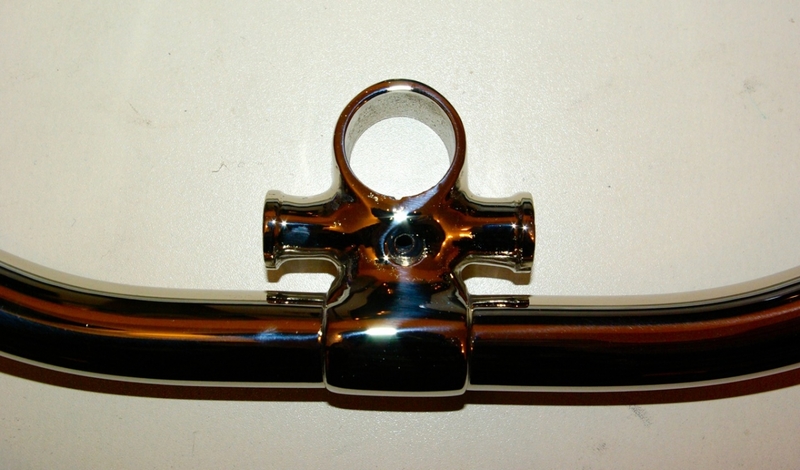 SUNNEN External Hone is used to hone the stem of a Norton motorcycle valve after application of hard Chrome for long life. 6. 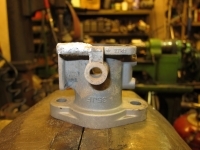 Experienced technicians at RAMOTO LTD are using appropriate fluxes and filler rods in bronze, brass and silver to join and repair different parts made of metals, such as cast iron, steel, bronze and brass. 6.1. Repair of a cracked motorcycle cylinder head by brazing in a high grade cast iron sleeve and subsequently honing the sleeve bore with a diamond hone. The checking of the bore is done with a “GO, NO-GO” gauge. 6.2. 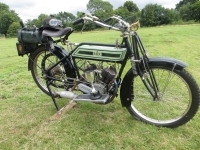 A 1935 Norton motorcycle frame in the photo, has had a frame surgery in its rear part, following a frame conversion for shock absorbers in the past. 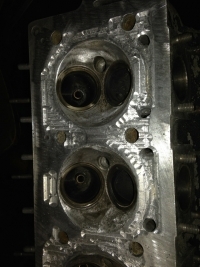 The tubes have been shortened and the original measurements have been retained. 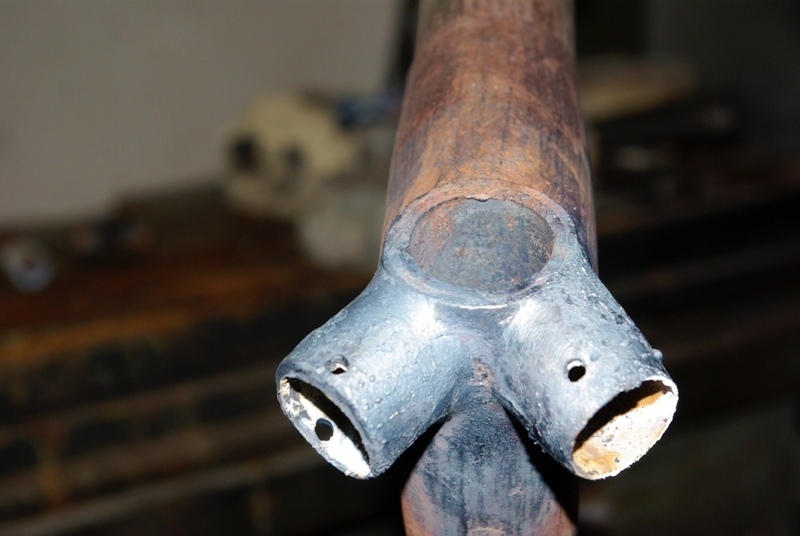 The tubes have been brazed with silver brazing rod and with SIF bronze rod. 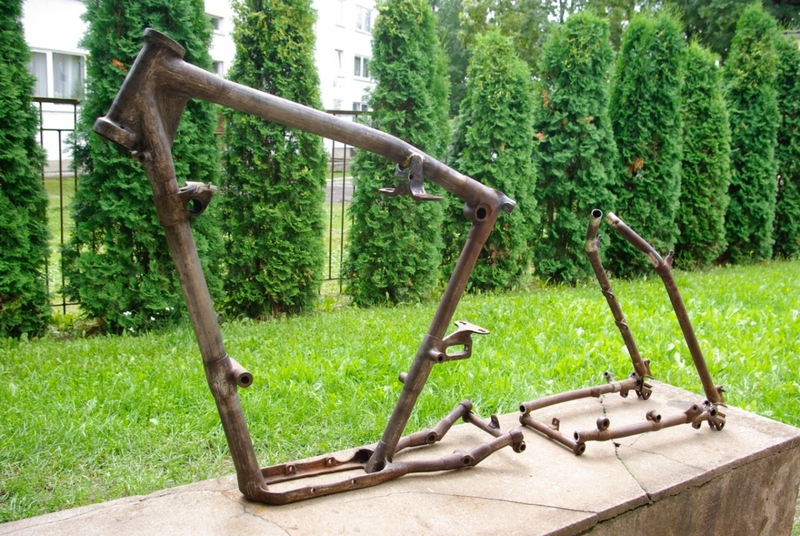 The same material was used to braze the Stars of The Freedom Monument in Riga. 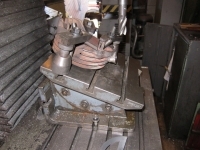 The job was done at the RAMOTO LTD workshop back in 2001 using the one and only HENROB 2000 oxy-acetylene torch in Latvia at the time.